Buck Rogers: Countdown to Doomsday is a science fiction-themed turn-based role-playing game developed by Strategic Simulations, a company known primarily for it’s “Gold Box” series of computer games based on the world of Dungeons & Dragons. You begin the game by creating a party of 6 characters, choosing their race and class and rolling their stats. Contrary to what you might expect you do not play as Buck Rogers, whose only presence in the game comes in the form of infrequent cameo appearances, giving your party an “attaboy” after you finish major missions. As members of the “New Earth Organization” (NEO) you help fight the “Russo-American Mercantile” (RAM), who is trying to destroy the earth using a mega weapon called the “Doomsday Laser”. The game features an interesting assortment of armaments, including classic melee weapons like swords paired with futuristic accoutrements like the needle gun and laser pistol. 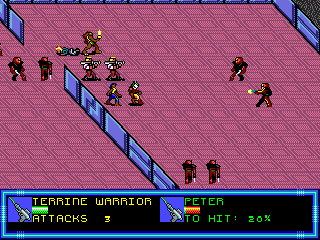 The combat system uses a grid-based battlefield on which you strategically move your characters, not unlike a simpler version of Final Fantasy Tactics. In addition to ground combat, you square off against RAM warships in your rocket ship, the “Malestorm Rider,” in random battles that occur while flying between planets or orbiting space stations. These space battles are also turn-based and allow you to maneuver and repair your ship as well as attack with multiple weapons. Countdown to Doomsday is simple compared to modern RPGs, and bears more resemblance to classic pencil-and-paper games. Short, at only about 10 hours, Buck Rogers is not the epic tale that would later come to define the genre, but is an excellent title in the style of the classic computer role-playing game. Buy Buck Rogers: Countdown to Doomsday on GameGavel or Amazon. Tagged Buck Rogers, Countdown to Doomsday, genesis, Review, RPG, sega. Bookmark the permalink.